Growing up in Fleurie, Yann Bertrand never thought he would become a winemaker. He briefly enrolled in commerce at a local university, and then travelled around the French Alps for a few years. When applying for local jobs, he noted that he was the son of a vigneron, and soon found himself working at wine bars and wine shops, surrounded by passionate wine geeks and artisan winemakers who often came to deliver wine themselves. Tasting wines in a new way, he began to ask himself some questions, and eventually decided that the metier of a winemaker would be interesting to him if he pursued it with the same passion as the role models he encountered. Returning to the Beaujolais, Yann began to learn from the incredible circle of producers that he never knew before - including well known people like Jean Foillard and Yvon Metras, and also the behind-the-scenes guru Jacques Néauport (who was the quiet right-hand to the legendary Jules Chauvet). The entire Domaine of Famille Bertrand encompasses one 7.5 hectare vineyard which is mostly in Fleurie with a bit over the line in Morgon, and has vineyards are between 30 and 110 years old. His parents had been slowly moving in the direction of organic viticulture since they took over the family domaine in 1992, and in 2013, the entire vineyard was certified organic. 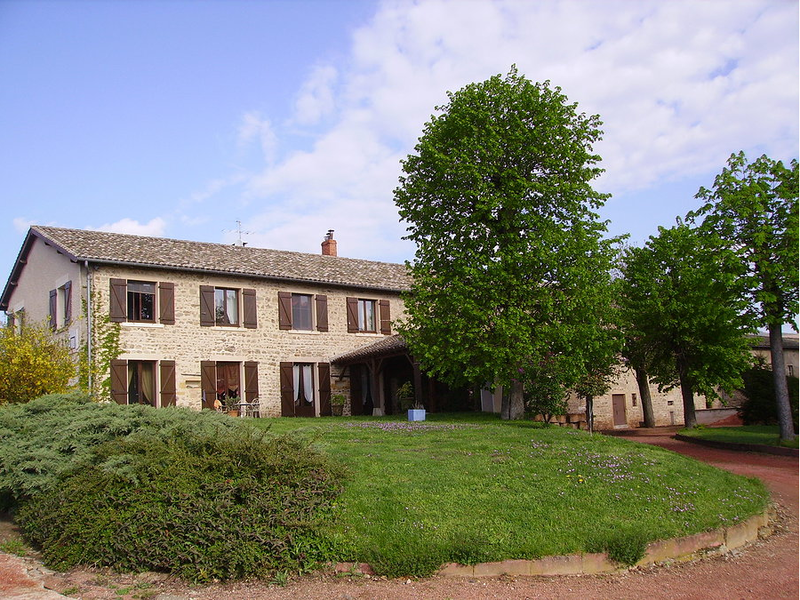 Additionally, Yann took on 1.5 hectares to farm on his own using biodynamic principles and created two new cuvées d’exception made in the neo-Beaujolais style of his well-known neighbors. From 30-60 year old vines grown on granitic sand. Organic farming. Traditional semi-carbonic maceration with native yeast and without SO2 for 10-15 days. 7-9 months ageing ⅓ in 500 liter used demi-muids, and ⅔ in tank. From 60 year old vines, grown on "En Rizière" (The Rice paddy). Organic farming, hand harvested. Traditional semi-carbonic maceration with native yeast and without SO2 for 10-15 days. 7-9 months ageing ⅓ in 225 liter used barrels, and ⅔ in tank. From 60+ year old vines on granitic shale. Organic farming. Cold carbonic maceration between 10-12°C for 20-25 days. Native yeast, with no sulfur added. 100% concrete tanks. Bottled unfiltered by gravity following the lunar calendar. From 60+ year old vines grown on granitic sand. Organic farming. Carbonic maceration with native yeast and without SO2 for 17-20 days. 7-9 months aging 225-liter used barrels. From 40 years old vines.Parcels at a high altitude are sandy granite whilst parcels at a lower altitude are sandy clay. Organic farming, harvested by hand. Elevage :5 months in very old barrels and demi-muids, minimum 10 years old from both red and white wines. 30% in demi muids, 30% in 300L barrels, 40% in 225 L barrels. . Racked by gravity. Bottled unfiltered by gravity following the lunar calendar. 60-110 years old vines. Organic farming. Old carbonic maceration for 23 days without manipulation. Native yeast fermentation with no added sulfites. Two hailstorms in May 2016 wiped out over 85% of the harvest in Grand Pré. All of the remaining grapes from the domaine were blended together and bottled as Chaos Supreme, bottled only in magnum and produced only in 2016. From 80-100 year old vines. Organic farming. Carbonic maceration a froid with native yeast and without SO2 for 17-20 days. 7-9 month aging 225-liter in used barrels (minimum 10 years old). Shallow soils with alternating bands of blue volcanic rock and volcanic schist. Cold, semi carbonic maceration between 10-12 degrees c for a period of 15 days without manipulation. No added sulfites or added yeast. 4,000 bottles produced.